You don’t get much more blunt then the opinion of a six year old. That’s why 6 year old Tatum F is helping with our coverage of the International Society For Technology in Education (ISTE) conference coverage. With hundreds of products on hand in the ISTE exhibition hall, specifically geared for grades K-5 and even more specifically K-2, there’s really no better person to talk to than the end user. 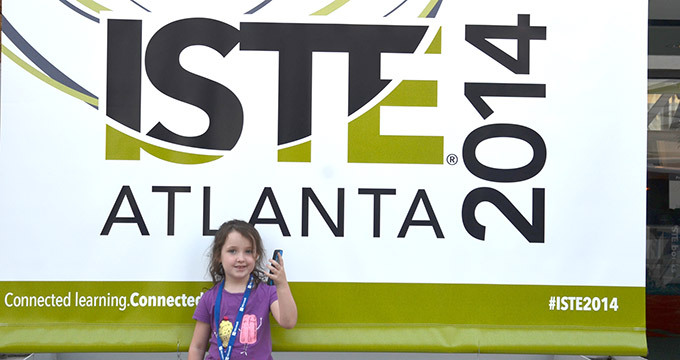 When we first started fielding this idea around the folks at ISTE loved it. Several PR companies loved the idea as well and are brave enough to take the challenge. Tatum is a very matter of fact kid that just tells it bluntly. If it’s great it will be great, if it’s boring she’ll say it’s boring. This should make for some great coverage. Tatum began doing video reviews at age three with Thedroidguy.com including some of the then new Android tablets, Fisher Price’s iXL, several Vtech toys and more. Now, after two years with straight A’s and a vocabulary to match she’s ready for the big league’s so to speak and with that in mind there isn’t a bigger educational technology conference in the country. Leading up to the event she was featured on a local Fox and ABC affiliate. Check out her video as she talks with a high school student creator of a robot.